I especially like the way every structural part has its own name, although I cannot judge whether they are traditional names (as I would prefer to believe) or new ones given by modern scholarship. Interesting to see the graves. They remind me of my few visits to graveyards in England. They’re so bare and isolated. Danes are far more territorial in death. A reflection of our personalities in life, I gather. Highgate Cemetery (where Marx is buried) is quite territorial and well furnished. A very good question for Trond. I find that many of the words translate literally into English, but that doesn’t really answer your question — I can’t tell which came first. The churches that you all are showing us these days are so different from what we have in latin cultures or countries. I love them. And the colour of the sky in these pictures…!!! Sometimes this is done with stone walls too, which I think is a crime, especially when they’re painted in bright colours during a political campaign. It would if it was fixed to something that couldn’t move horizontally itself, otherwise it would be just like in the Tintin album in which Thomson and Thompson, who are in a spaceship on its way to the Moon, hold to each other while being in weightless conditions… before both crashing down when the engine is switched back on. 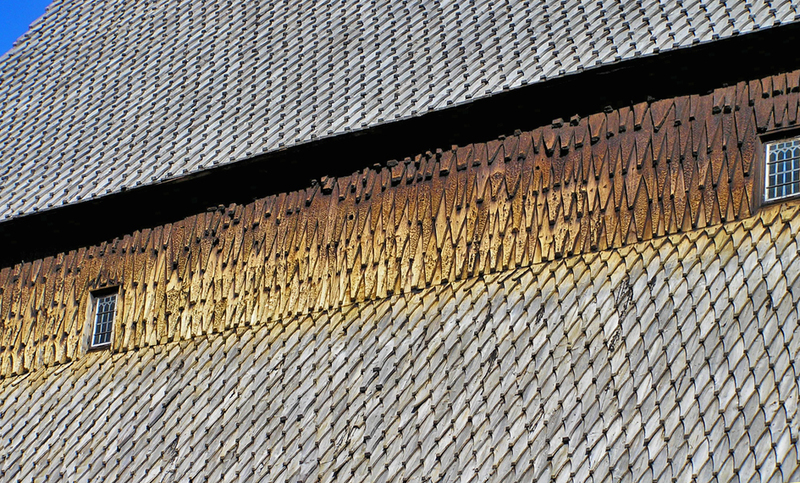 You are right: these shingles are beautiful. What a piece of artwork! 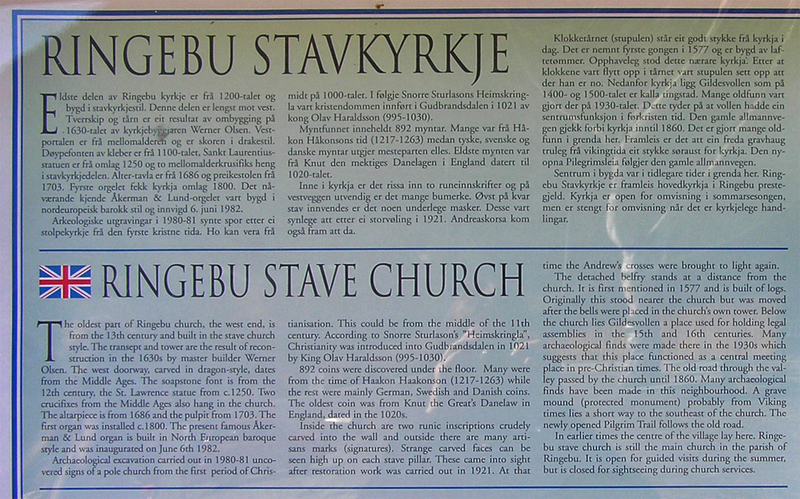 I wonder what the Anglo-Saxon and Danish churches of England looked like? They were almost all built of timber; the Normans replaced them with stone churches, apparently. Yes, it’s this one, Greensted Church. (Actually, they seem to be having a bit of trouble fixing the date of it.) You can see the old bit in the picture on the left. The “wonderful detailed” Victorian brick base is a bit hard to take in the context of a 9th century Saxon log cabin, but never mind. We’re having a veery deep blue sky at the moment. This church is strange, I think so too. Sig, we agree: we don’t like the red paint, hate it on stone and like the shingles. Here’s an Anglo-Saxon stone one – not half as interesting as your Greensted one, though. The leper’s squint, yes. It’s an early version of cctv. 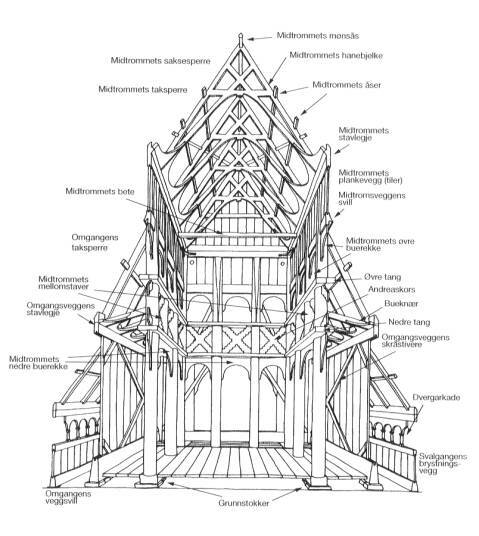 There’s a Wikipedia article on Anglo-Saxon buildings. Here’s a photo of a largely medieval church that is taken to be the successor to an originally Danish church in Cambridge. The C19 bit is pretty gross. 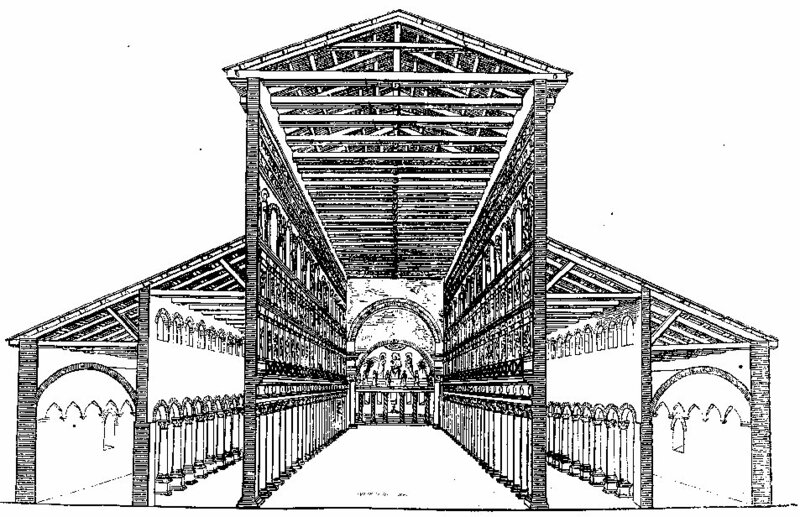 l. muren under (kyrkje-)tårn, tårnfot (Innh i formi “stupul”). Å. 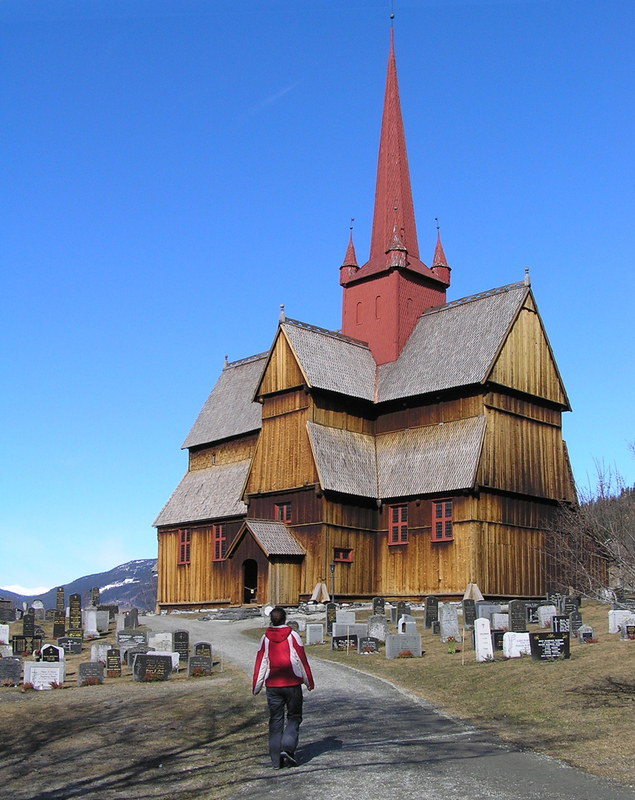 2. klokketårn, klokkehus attmed ei kyrkje (So, Va). Å. 3. hop av ting som er lagde upp på einannan i ein viss orden, lam. Bord~. Pengar hev eg i stolpar. Å, R. Heiter oftast “stopel”; elles “stopedl” (Rog), “stobel” (sumst. i Rbg), “stopule” el. “stopuli” (VTel, Set, Åmli i AAgd, pl. “stoplar”), “stupul” (Ndm, ATel o. fl.). Å, R, R3. 5. mura pilar el. sule, t.d. til vegmerke (Innh). “Mantelstupul” (i skorsteinen); “steinstupul”. R.
6. turr stomn, høg trestuv (Tr); “myrstupul”. R.
7. pinn, plugg NGbr), T.
8. liten tapp som skålene på ei sylgje heng etter (VTel). R2. 9. undersett, tettbygd kar (Tr); stridlyndt raring, einstøding (Tr, Va); òg: stiv, keiveleg kar (Ndm, òg i formi “ståpul”). R. – Gn. st&oogon;pull m., tårn, tjukk stolpe el. pilar. (Tyd. 3 frå t.). T.
Meaning 3 shows that it’s the native form of the word you know as stabel “stack”. Its German cognate is Staffel and the English is staple, and both these are within the range of støpul. The word first meant support-device, formed from the ‘staff’ word meaning “support, stiffen” and the instrumental ending -ill. 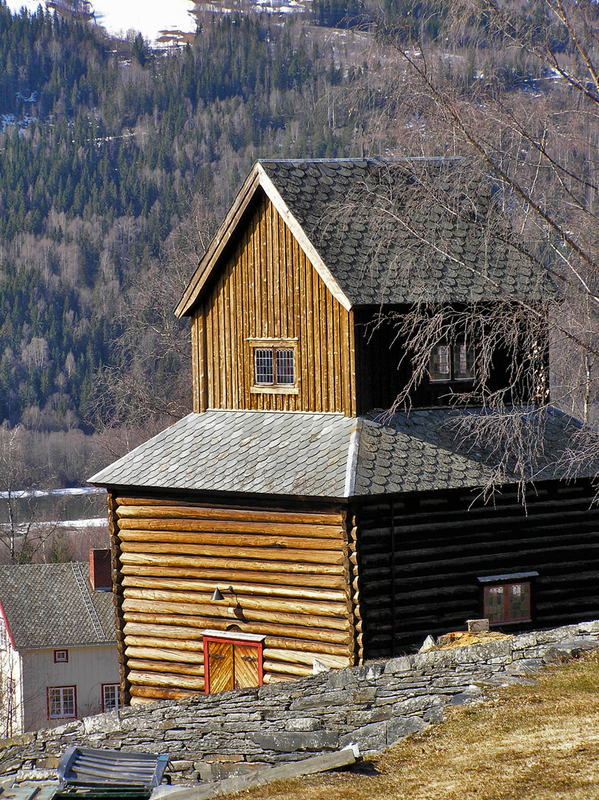 In Johan Falkberget‘s breakthrough historical novel Den fjerde nattevakt (1923) the støpul at Røros is a leitmotif. It seems like a mix of old and new terms. Stav, svill, stavlegje, bete, ås, rom are old. Arkade is obviously new. It seems like a mix of old and new terms. So if I were to guess, I’d say that the terminology is recent, but many of the terms are inherited. What do you mean by this, Trond? Yes, it has a wide range, this word stopul; whereas, as far as I know, a belfry is just a belfry. An ås is a purlin, then, as well as an escarpment. Even so, it’s hard to know what Richard III meant by “An ås, an ås, my kingdom for an ås“. That’s very good to know. Rattle, paddle, (chattel, wattle?). Thanks. Some Germanic -Vll-words are Latin words with the diminutive suffix -Vll-, e.g. catillus > Eng. kettle, sigillum > Eng. seal. I think there are some examples of folk-etymological reinterpretation of such loans as instrumentals, but I can’t remember any of them now. I don’t think there are any back-formed verbs (say, *to ket “to boil”). Treadle and spindle and handle are full-fledged members of this group that Trond is talking about, I suppose, while pedal is a sort of honorary or accidental member. But not of the -ill kind. Eng. gable apparently IE “split twigs”, but maybe a Gmc. folk-etymology “giving (=serving) device”? There’s also a suffix -il that forms adjectives from verbs, meaning “prone to -; in the habit of -ing”. I’d think that the two suffixes are related. Some of my words may rather belong here. Lat. speculum > Ger. Spiegel “mirror”. Possible folk etymology, but maybe rather qualifying as a calque. The Lat. verb specere has a West Germanic cognate *speh- “look, spy”. I want to invoke association with the (Verner’s law) alternation speh ~ speg of the Germanic verb to explain that -c- becomes -g-. We need dictionaries written in mirror writing. Ooh, I’ve got one: dreydl. Wikipedia: The Yiddish word “dreydl” comes from the word “dreyen” (“to turn”). No. støvel “boot”, MN stýfill, ult. from It. stivale (I cheated for the origin). ON stýfa “cut short (to stubs)”. Scots “speer” means something like “investigate”, especially by questioning. That’s ON/Nyn. spyrja, Sw. (arch) spörja, Da. spørge with “false” g, Bokmål spørre. Semantics: “follow a trail” -> “inquire” -> “ask”. The past participle can mean “heard of”: Katten vart aldri meir spurd “The cat was never heard of again”. Related to English spoor, German <Spur? The latter is used in mathematics where English uses trace: the sum of the eigenvalues, or the sum of the diagonal matrix entries. We don’t say “vanish without a spoor” in English, but we could. I once considered including a pun in a mathematical paper — something about a Cheshire category. Even when the category was taken out of the picture, something about it remained: not a smile, but in fact a sort of trace. So it didn’t vanish without a trace. Oh, well. Related to English spoor, German Spur? I didn’t know spoor, but yes. The relation between the noun and the verb seems somewhat odd, though, but I’ll have to look into that before I’m sure. I saw an etymology that said spoor came into English via Afrikaans. I always thought they must be cognate, though, ever since I found the Germans use Spur for “lane” (of a highway). OT, Crown, but how’s the Icelandic volcano affecting Norway? All our airports have closed here, starting in Scoland and working south. I can’t remember this ever having happened before. Why not, I wonder? Perhaps because the last similar case happened in 1823, at least this is what newspapers write. I do not remember it either. But newspapers have a much longer memory. Yes, 1821-23 was the last time it happened at Eyjafjallajökull , but what about when other volcanos have erupted since? Is this one somehow a special case? I have looked for a list of the most important volcano eruptions and their effects in the last hundred years, but for the first attempts I could not find any, and right now I cannot go on searching. However, at some site they wrote that when Mount St. Helens in the Rocky Mountains erupted in May 1980 and blew 1 km3 of volcanic ashes in the air, about the same amount of flights were deleted all over Northern America. flightradar14.com has a good map of working and closed airports in Europe. Right now the site seems to be overburdened, but this Hungarian article has an image of the map of some 40 minutes ago. Oh, thanks. I was wondering why this didn’t happen with Mt St Helens. I guess it did. What a fantastic site! The planes look like insects. sorry, my mistake, it is not 14 but 24: http://www.flightradar24.com . But it is overburdened anyway. wow, you managed to check it in the meantime. From here it is unavailable now. It seems to many Eastern European guest workers are worrying for their London flights. There aren’t any flights in or out of Britain any longer. I love this flightradar site! Trond, you should look. It doesn’t look like there are any planes flying in Spain or Portugal, either. Thanks. I’ve looked a couple of times during the day, and also this evening. There’s still traffic on the continent. I think the server is so overworked that slow updating makes the map look empty. 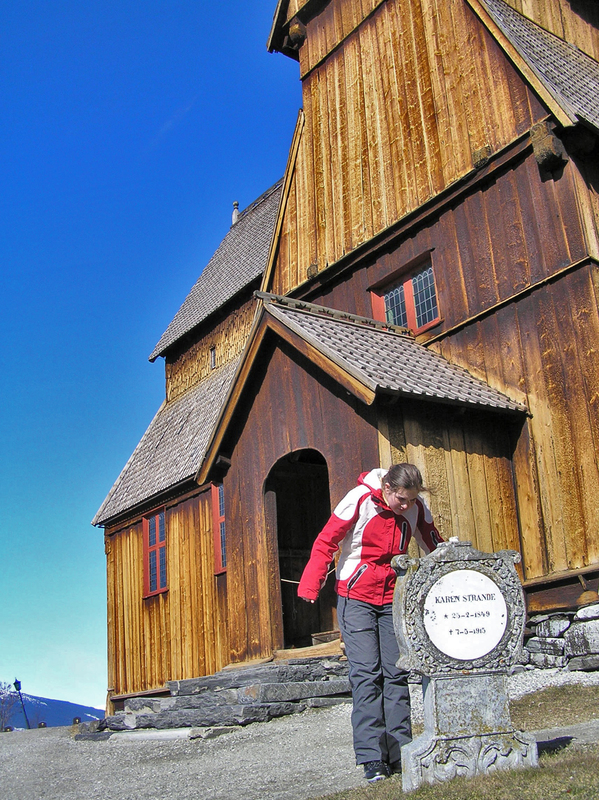 This article on Forskning.no says much of what I did, except the glacier thing. It also links to the ICAO manual on volcanic ash (that I haven’t read yet). Among other things it tells the story of the BA flight in 1981. Because it’s Jehovah’s punishment of Iceland for the usury committed by its banks. Just as with the dud banking, the fallout affects outsiders too. I wish He’d just smited the first-born. But why is He punishing us and not the Icelanders? Actually, except for the people who missed their flights, most people seem rather pleased. Oooh! We can smell it in our garden! Sulphur. That must be a different metaphysical being. If it goes on for two years, someone may have to adopt him. Though, being America, they might then just send him back. “But why is He punishing us and not the Icelanders?” Par for the course for these Oriental Despots – life is cheap in the East. Back on line after a detoxifying day … :-) and read all about that volcano. Everything’s fine as long as you don’t want to take a plane. It did smell like sulphur yesterday evening, though. My brother’s already at home, thank you! And of course I’ve checked Studiolum’s great link last night.